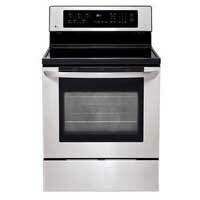 The blue interior of this LG electric range adds a refreshing touch to this overall stylistically pleasing model. The oven capacity is amazing with 5.6 cu. ft., able to hold almost anything. The two full-width racks can fit in seven different positions for the most spacing flexibility I’ve seen. The warming zone on the cooktop is a nice bonus feature in addition to the five radiant elements that heat pans quickly. The console panel on the backsplash is intuitive and user-friendly, adding to the overall appeal of this surprisingly low-priced model for $852.